Carrot halwa and pal payasam are the first desserts I learnt to make. Before that, it was just popping a spoonful of sugar into my mouth whenever the sugar craving set in. Learning this dessert meant getting my fingers cut multiple times, because I never learnt the art of grating the carrot without my hands getting cut in the process. Now years later, I have become smart and I don’t get myself injured while grating carrots. Its for better things like being careless with hot pans and pots and all. Well, there will be a day when I will stop being so accident prone. 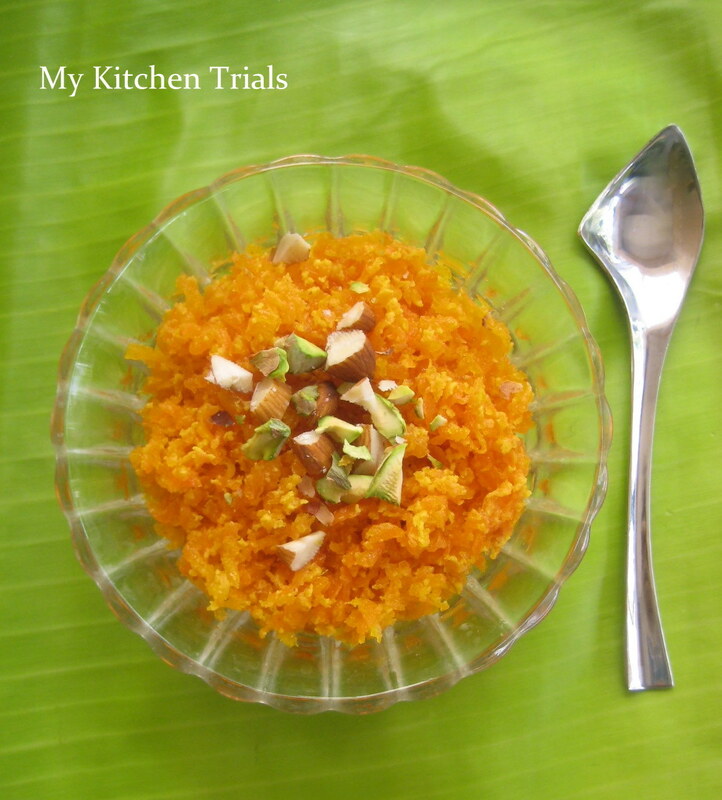 Till then, hoping for more ‘injury free’ carrot halwa days! Put the grated carrots and the milk together in a microwave proof bowl. Microwave on high for about 15 minutes, stirring once in every 5 minutes, till the carrots are cooked. You can also cut the carrots into rounds, cook them with milk and pulse (not puree) them once in a mixie once its cool. Add the sugar and cook for another 5 minutes. Mix once and add ghee and cardamom powder. Cook for a further 2-3 minutes till the liquids are almost dry. Decorate with chopped nuts and serve hot or cold. Serves 1-2. 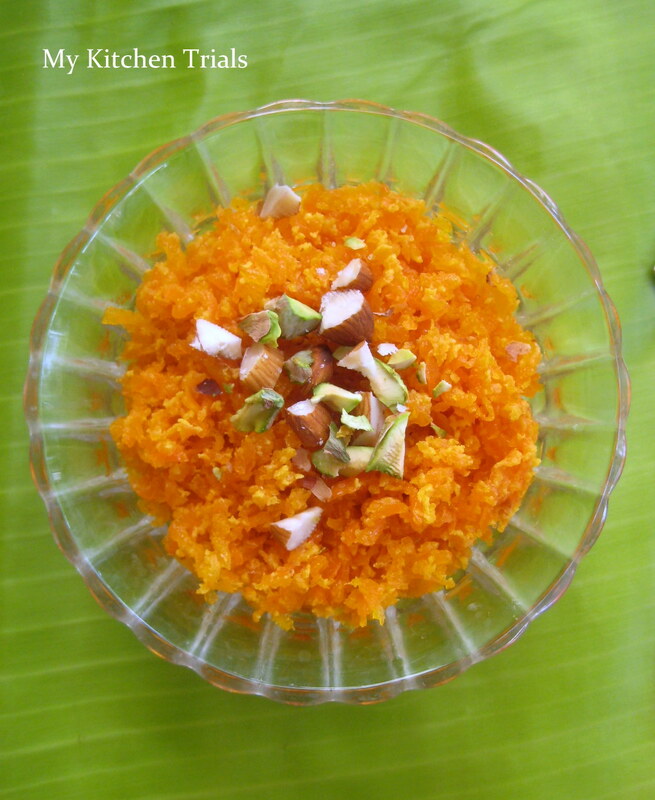 I love the color of this halwa and the pics look so tempting with plantain leaf background. Love it totally!!! Love the pic Rajini. such an easy version!!!! Looks delicious. I love the colours the green and orange. Love the idea of making it in microwave. That’s quite a differently shaped and nice spoon in the pic. I like your microwave version of the halwa. Delicious Halwa, Our Family Favorite!!!!! i too make them in MW, but my DH Loves it when i make it the traditional way on stove-top!!!! 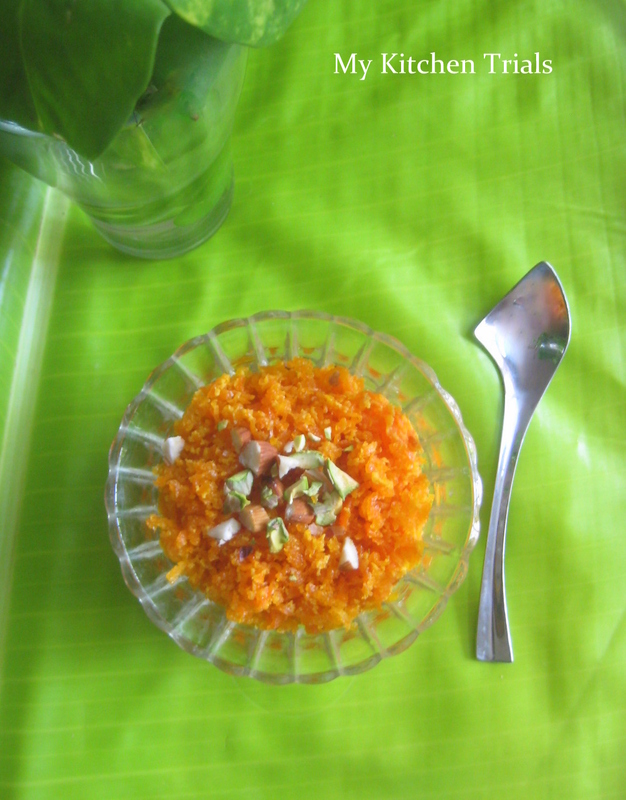 Umm Carrot halwa looks so good! Thanks again for your submission to Microwave Easy Cooking March Edition. You have a great eye for photography there!